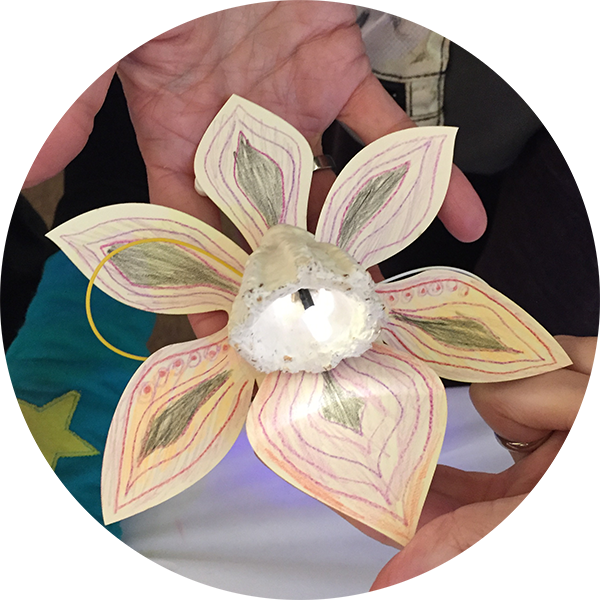 This project invites the public to explore sewing circuits in a playful free workshop that results in light-up felt bracelets that participants take home. This blended art and technology project will use laser cut felt, LED lights, 3V coin cell batteries, conductive thread and metal snaps that act as the on/off switch. As people sit in communion over the slow activity of hand sewing, they will have the opportunity to chat and share their own stories of their experience with hand sewing in their families. More information here: https://www.sjquiltmuseum.org/events/ and link to instruction sheet. 3D printed wings with skin of bacterial cellulose. Designed by student in Biodesign Challenge team. Project conducted at Viva CalleSJ, Japantown Halloween and a November date TBD in San Jose. Layers of SJ explores San Jose's identity through photos and collages of artifacts from San Jose's past and present. Using photo stickers, the public is invited to create collages and stories about San Jose. https://layersofsj.weebly.com/ Takara is conducting this project as a San Jose Creative License Ambassador. Creative License Ambassadors is a program of the San Jose Office of Cultural Affairs. Through this program local creative professionals serve as “ambassadors,” championing the power of creative expression in everyday life by inspiring creativity through public hands-on artistic projects. This four consecutive Friday nights shadow puppet event is an AYA arts public activation programming. Lead artist is Michele Guieu. Artist Lauren Cage and I are Supporting Artists. My focus was on articulated and wearable shadow puppets. More information here. Process and event images here. North American Association of Environmental Education Conference, Spokane, Washington, October 10th, 2018. Takara will be presenting " Designing with Fungus/ Conversations on Bio Materials and Conservation" in a Bright Spot session. Takara is a guest instructor teaching four hours of Design Thinking in Day 1 of this program on August 6th, 2018. 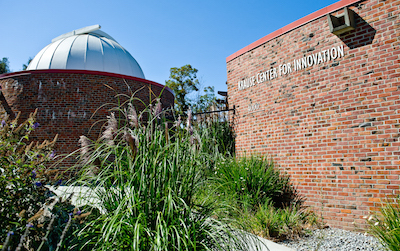 Krause Center for Innovation at Foothill College, Los Altos, CA. This program is open to residents of California who are women, especially women of color, women who have served in the military, and women with special needs (i.e., learning or physical disabilities). A teen summer camp in East San Jose focused in making and exploring. I will be teaching Week 6, the Design Your World camp week (July 30th to August 4th). Workshop and presentation at the LX Conference San Francisco, CA, March 19th and 20th, 2018. Speaker of presentation: Shared Urban Spaces, Prototyping Public Spaces. Stanford Humanities Center, Levinthal Hall, Stanford University, Stanford, CA. November 13th, 2017. Sponsored by the Program on Urban Studies and the Stanford Humanities Center. An Unraveling the Knot workshop focused on sculptural knots explored through 3D printing and CAD design using BeetleBlocks. This teen workshop was conducted at Dr. Roberto Cruz Library, San Jose, CA. October 23rd, 2017. 2:30-4:30pm. This workshop is part of a series of youth workshops exploring and reinterpreting cultural knots through a range of media. Photos from this workshop are here. A bio-art project exploring fungus as a design medium. It resulted in a fungus light sculpture & in a public workshop. It was made possible by a 2017 Creative Impact Fund Audience Engagement Project Grant from SVCreates. The public workshop were conducted at the San Jose Museum of Quilts & Textiles on June 2nd, 2017. Collaborating organizations are the Tech Museum BioDesign Studio and the San Jose Museum of Quilts and Textiles. Chandelier completed in October, 2017. A 2017 San Jose Arts and Cultural Exchange Grant Project . This is an exploration of cultural knotting traditions in a range of mediums. Workshops will be conducted in San Jose, California and in Dublin, Ireland. The collaborative exploration of knot art traditions can be a creative way to build connections among communities and to explore the common threads that bind us. By re-interpreting Celtic Knots forms through the lens of modern technology tools and traditional Japanese knot cording, Unraveling the Knot seeks to explore the bonds, and colliding and merging stories that we form as cultures connect. Takara collaborated with the Alum Rock Educational Foundation and the Chester Beatty Library to bring this project to life in Summer 2017. A 3D print sculptural series imagining subterranean natural structures under the LEGO board. 2016-2018. Project is a work in progress. Exhibited at Works/San Jose Benefit Auction 2016, Works, San Jose CA. December 2nd-December 10th, 2016. 2018 Solo show in the works. More information coming soon. 3D printing sculptural explorations of drought impact in Northern California. Left: Memories of a Thistle. This collection is a work in progress.